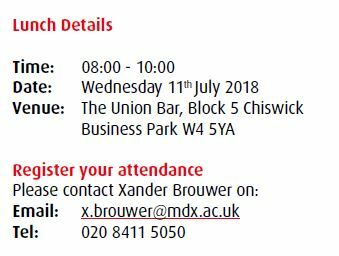 Please join Middlesex University for breakfast on Wednesday 11th July to learn more about working in collaboration with Middlesex University. They are keen to hear industry views and discuss how they can offer solutions to current and future workforce skills requirements. Middlesex University has a long tradition of partnering with industry and the public sector. They are experts in developing effective workforce strategies and bespoke training provision, including Degree Apprenticeships. By working with them you receive tailored solutions expertly delivered by their leading academics and workforce specialists. Middlesex University introduced the first business degree some 50 years ago and continue to work with a wide range of businesses. Recent clients include Worldpay, Consalia, Halifax Bank, Mitsubishi, ASDA, Royal Mail, Toshiba Tec and Sony Mobile. please let them know when registering your place.